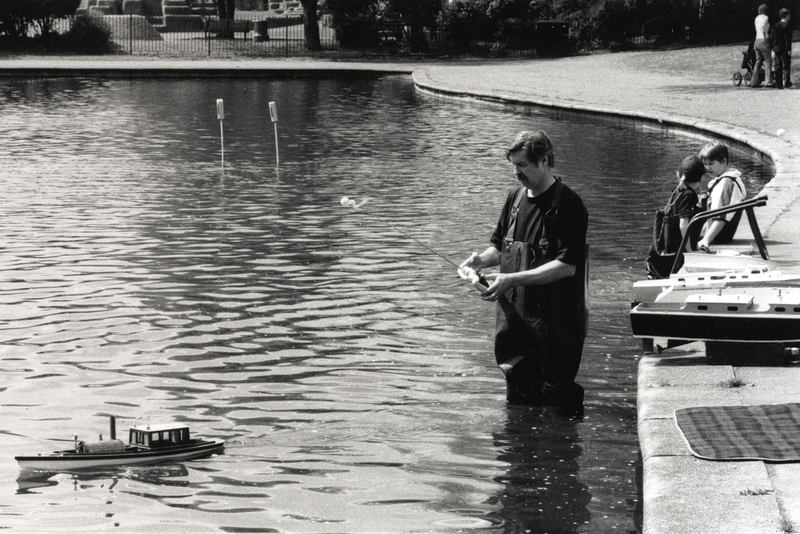 Spitalfields Life contributing photographer, Lucinda Douglas-Menzies became fascinated by the Victoria Park Model Steam Boat Club while out walking in the park. 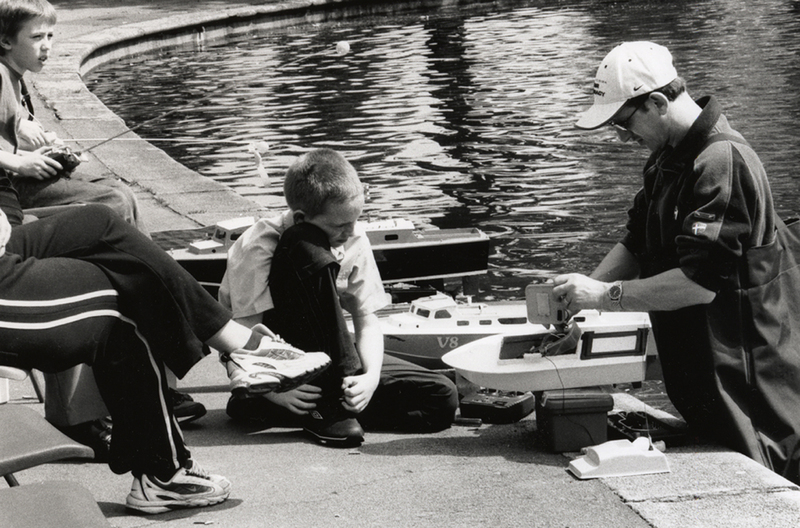 Over successive Sundays, her interest grew as she went back to watch the regattas, meet the members and learn the story of the oldest model boat club in the world, founded in 1904. 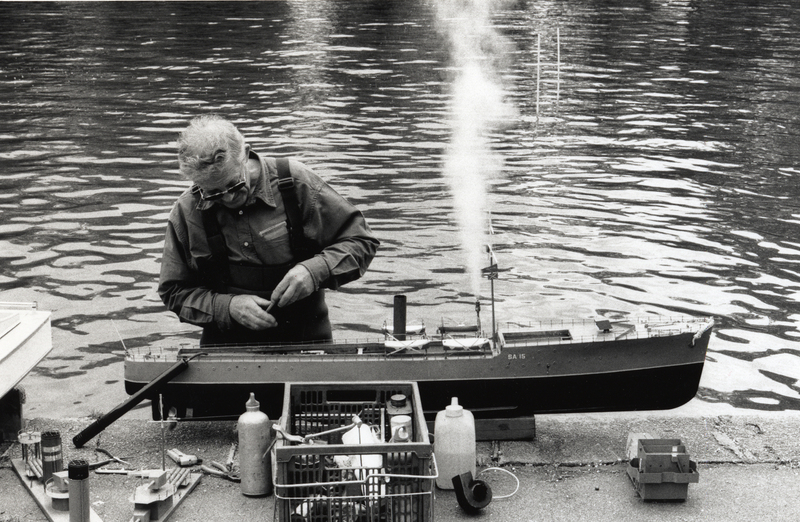 Her photographic essay records the life of this society of gentle enthusiasts, many of whom have been making and racing boats on this lake for generations, updating the designs and means of propulsion for their intricate craft in accordance with the evolution of maritime vessels over more than a century. Starting on Easter Sunday, the club holds as many as seventeen regattas annually. 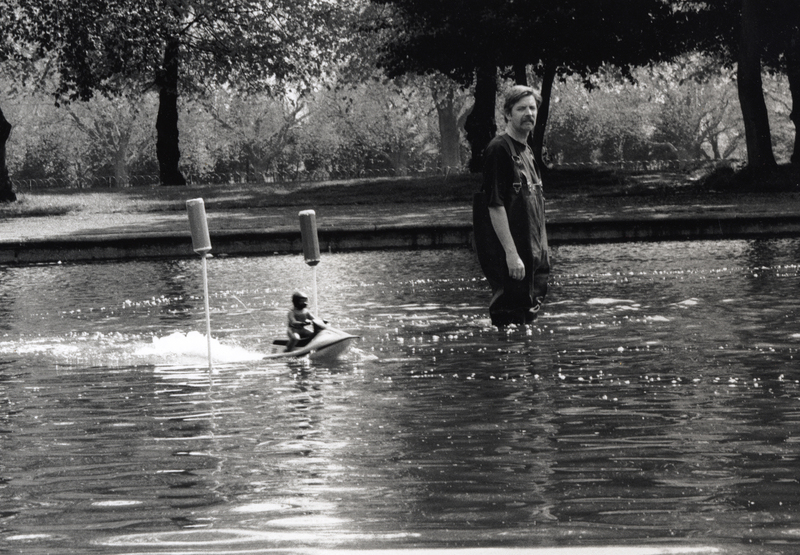 Meanwhile, the members had pulled on their waders and were preparing their vessels at the water’s edge, before launching them onto the sparkling lake. 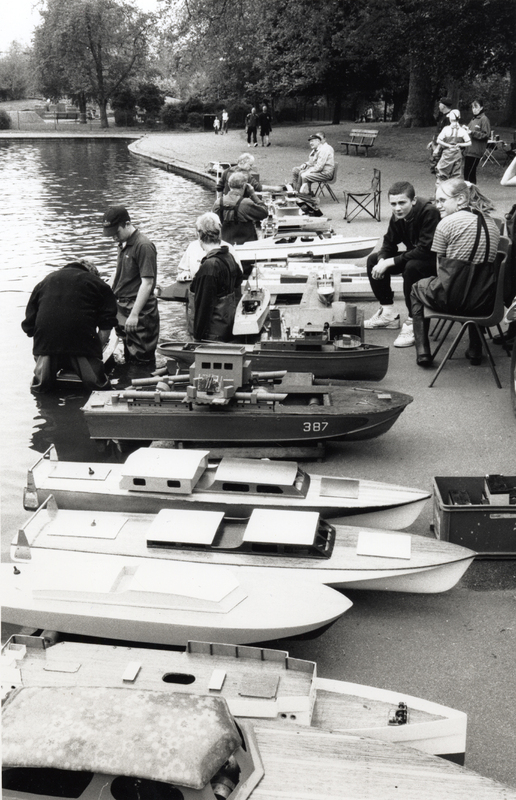 Here Norman introduced Lucinda to Keith Reynolds, the club secretary, who outlined the specific classes of model boat racing with the precision of an authority, “There are five categories of “straight running” boats. 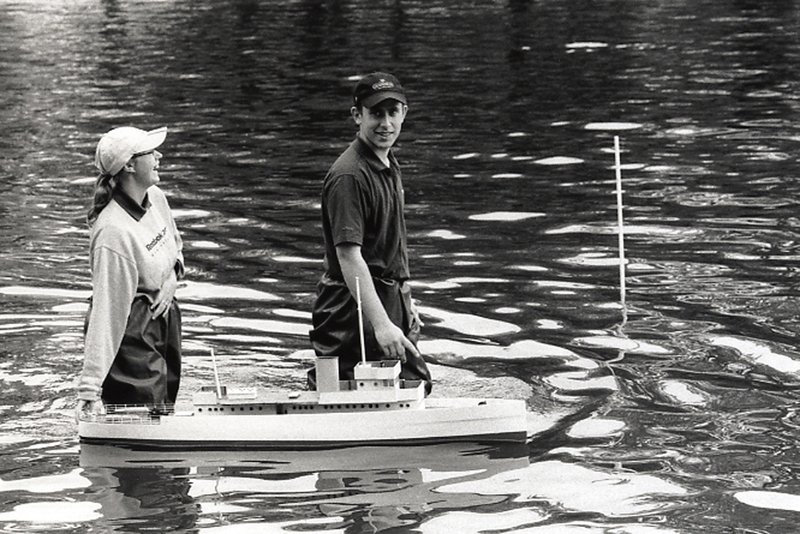 These include functional, scale boats (fishing boats, cabin cruisers, etc), scale ships (warships, cruise boats, liners,merchant ships, liners, merchant ships – boats on which you could sustain life for more than seven days), metre boats (with strict rules of engine size and length) and – we had to create a special category for this one – called “the wedge,” basically a boat made of three pieces of wood with no keel, ideal for children to start on.” In confirmation of this, as Lucinda looked around, she saw children accompanied by their parents and grandparents, each generation with their boats of varying sophistication and period design, according to their owners’ experience and age. Readers of Model Engineering Magazine were informed in 1907 that “the Victoria Park Model Steam Boat Club were performing on a Saturday afternoon before an enormous public of small boys who asked, ‘What’s it go by mister?’” It is a question that passersby still ask today, now that additional racing classes have been introduced for radio controlled boats with petrol engines and even hydroplanes. 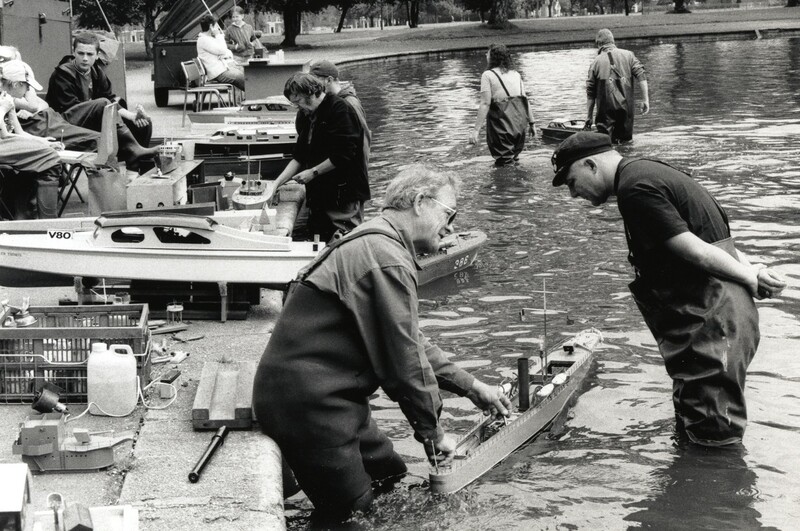 It was an invitation that Lucinda could not resist and she was rewarded with a spectacle revealing more of the finer points of model boat racing. She discovered that “straight running,” which Keith had referred to, is when one person launches a boat with a fixed rudder along a course (usually sixty yards long) where another waits at the scoring gates to catch the vessel. The closer to a straight course your boat can follow, the more points you win, defined by a series of gates around a central white gate, which scores a bull’s-eye of ten points if you can sail your boat through it. On either side of the white gate are red, yellow and orange gates each with a diminishing score, because the point of the competition is to discover whose boat can follow the truest course. 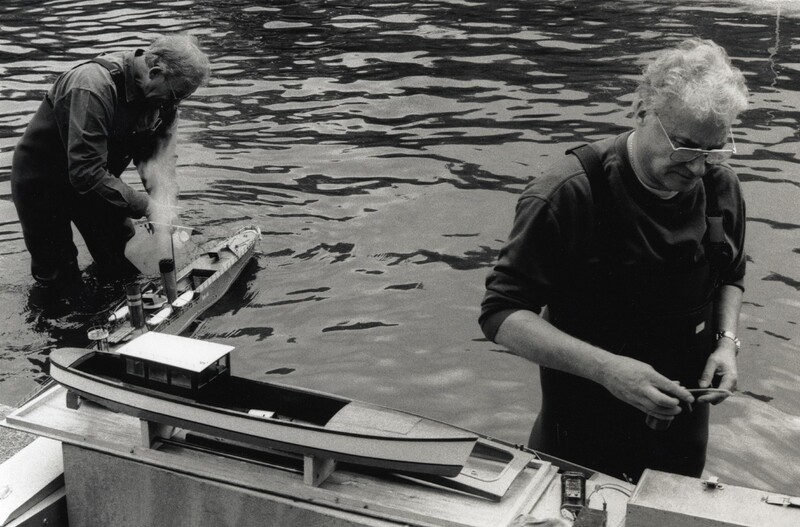 Witnessing this contest, Lucinda realised that – just like still water concealing deep currents – as well as having extraordinary patience to construct these beautiful working models, the members of the boat club also possess fiercely competitive natures. 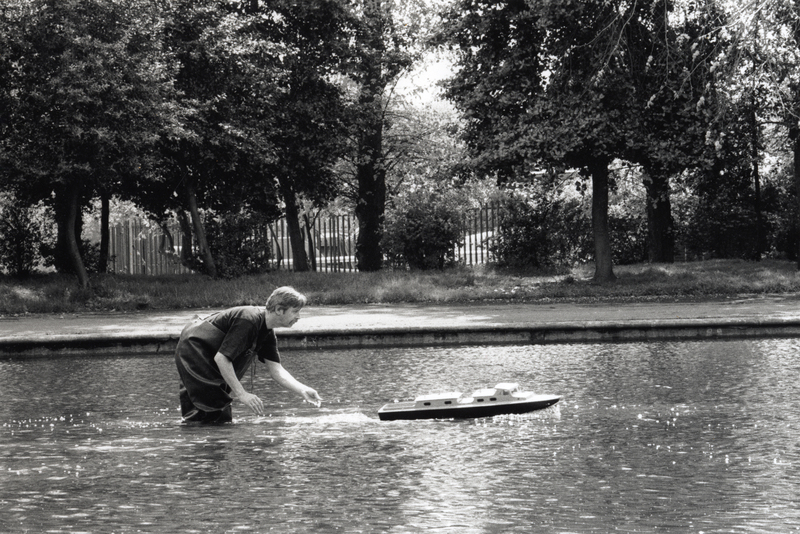 This is the paradox of sailing model boats, which appears such a lyrical pastime undertaken in the peace and quiet of the boating lake, yet when so much investment of work and ingenuity is at stake (not to mention hierarchies of individual experience and different generations in competition), it can easily transform into a drama that is as intense as any sport has to offer. Lucinda’s eloquent pictures capture this subtle theatre adroitly, of a social group with a shared purpose and similar concerns, both mutually supportive and mutually competitive, who all share a love of the magic of launching their boats upon the lake on Sundays in Summer. It is an activity that conjures a relaxed atmosphere – as, for over a century, walkers have paused at the lakeside to chat in the sunshine, watching as boats are put through their paces on the water and scrutinising the detail of vessels laid upon the shore, before continuing on their way. 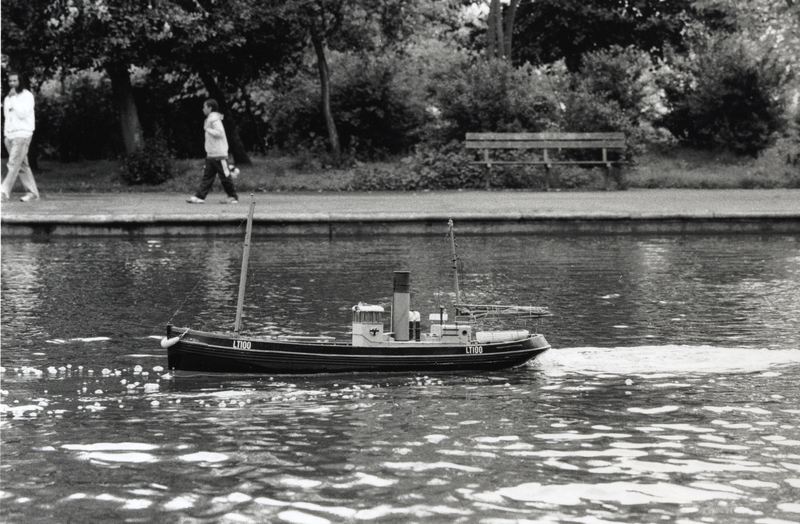 I remember the steam boats on the lake, well it wasn’t really a lake but that is what we called it as children, I lived in the area from 1949 – 1959. You could sit and look at the boats for hours, sometimes we got caught up in waiting for boats to be set off by their owners and then when we asked the time from someone we then had to run all the way home. The photos brought back lovely memories. Delighted to see your photos. I have been building steam engines for years and I now think it is time to build a Stuart D10. I am a western Canadian, the prairies, and I have no idea what hull size and configuration might be appropriate for this engine. Any suggestions would be helpful. Thank you for your anticipated response.